After more than four years of planning, talk has turned into action for Lawrence and Kansas’ first cohousing community. Delaware Street Commons organizers played host to a groundbreaking ceremony Saturday at the East Lawrence site, 1224 Del., and expect to have their residents move into the unique 23-home neighborhood by next summer. Rich Minder, one of the group’s original organizers, said the project had turned into a reality because of people’s strong desire to know their neighbors. “Our biggest hurdle has been that people just didn’t know what we were talking about when we said cohousing,” Minder said. “What we tell people is that when you talk about cohousing, the first thing you have to talk about are neighbors. Delaware Street Commons, like most cohousing projects, uses design as a way to ensure that neighbors make frequent contact. Perhaps the most significant design element is that the homes — which are purchased, not rented — are built in a cluster style. All 23 living units, which range from two-bedroom flats to three-bedroom, two-story townhomes, are contained in five buildings at the site. That allows the 2.2 acre project to devote roughly half of its acreage to open and green space. Included in the green space are community gardens. Neighbors decide what to plant, then work together to maintain the garden. The center of most cohousing projects is a common house. For Delaware Commons, it will be a 2,240 square-foot home that will include a shared TV room, an exercise area and a small mail center. The common house also includes a kitchen and a dining room that can seat up to 50 people. Each home in the development has its own kitchen, but the neighborhood likely will have a community meal in the common house three to five times per week, if residents choose to partake. “We really feel like it will be an extension of our own houses,” said Jennifer Distlehorst, a Lawrence resident who has agreed to purchase a three-bedroom townhome in the development. The project is the first cohousing development in Kansas, but the idea has become fairly common in other areas, including California, Colorado and parts of the Northeast and Northwest. According to the Cohousing Association of the United States, 165 cohousing developments are either open or under development in the country. Distlehorst says logic explains why the concept has become more popular since its humble U.S. beginnings in the late 1980s. Minder believes other societal changes also have led to the yearning for more neighborliness. He said when women began entering the work force, it created major changes in both the family structure and neighborhoods. 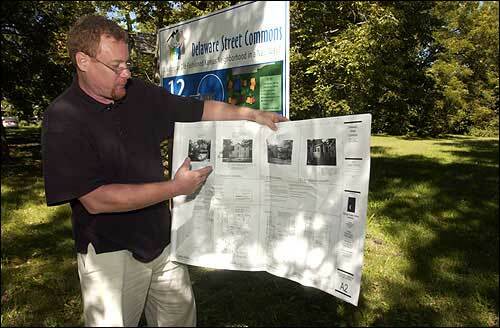 Rich Minder, one of the organizers of the Delaware Street Commons, unfolds a set of plans at the site. Ground was broken Saturday on the project, the first of its kind in the state. Minder believes that, once completed, Delaware Street Commons will draw interest from other people in the city and the state who want to create a similar type of development. “I think this will make a big impact on our local and regional housing market,” Minder said. Lawrence real estate professionals said it was probably too early to tell whether the concept would take off in Lawrence. Bryan Hedges, broker with Realty Executives-Hedges Real Estate, said area homebuyers still had varying opinions on how close they wanted to be to their neighbors. Renate Justin said Lawrence should be prepared for the idea of cohousing to grow. That is what has happened since the cohousing development she lives in, Greyrock Commons, opened in the mid-1990s in Fort Collins, Colo. In 2000, the city’s second cohousing development was completed, and Justin said a third development in the city was in the planning stages. “We constantly get people who would like to live here, but we are not building anymore units,” Justin said. The development is home to about 70 families and includes traditional cohousing features like a common house. It also has a 10-acre native plant and wildlife preserve and a community chicken coop. But the developments have had to overcome some misconceptions, Justin said. Distlehorst said the Lawrence project also had to overcome some of that type of thinking. “We tell people it is much more of a condo than a commune,” Distlehorst said. For example, unlike some communes, there’s no sharing of financial resources, each resident has an individual ownership stake in the property and, yes, clothing is required. People are beginning to understand the concept, Minder said. Ten of the project’s 23 units have been spoken for. Future residents secure a spot in the development by putting down 5 percent of a home’s purchase price. Home prices range from $110,000 to $205,000, depending on size and finish packages. By putting 5 percent down, people also become a shareholder in Lawrence Cohousing Group L.C., which is the business organization that serves as the developer for the $2.8 million construction project. “It is a group of future neighbors who make up the company, which makes it unique,” Minder said. Distlehorst said neighbor control of the development design and concept was one of the appealing factors. Saturday’s groundbreaking was the ceremonial start of the project, but Minder expects actual construction work to begin in the next couple of weeks.